Cantor Shlomo Glick both sings Jewish prayers and works as an EMT. (CNN) - According to Jewish tradition, on Rosh Hashana, God decides who will live and die during the next year. For Cantor Shlomo Glick, the holy days - which begin the Jewish new year - are particularly poignant. 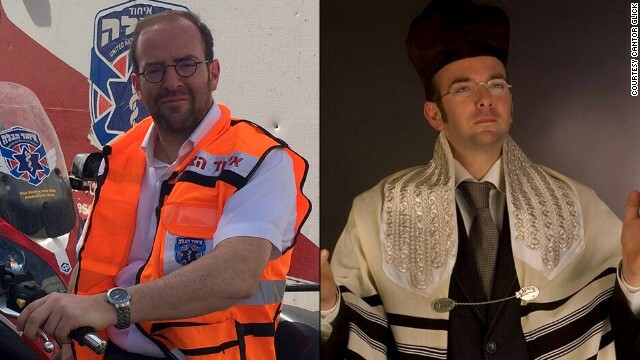 Not only does Glick, who lives in Jerusalem, stand at the front of synagogues and sing solemn prayers on Rosh Hashana, but he is an EMT for United Hatazalah, a volunteer emergency service. Glick, 36, spoke to CNN via email about his spiritual and secular roles - including a time he stopped religious services to treat a man in cardiac arrest. Q: For people who might not know, can you explain a bit about the role of a cantor? A: A cantor leads Jewish congregations in prayer. We are professional singers who have extensively studied the order and meaning of the prayers in addition to how to carry our voices. A good cantor tailors the tunes and style of prayer with the audience to ensure that everybody sings in unison and finds meaning in the service. Q: Which job, EMT or cantor, do you think is more important? A: I love performing and inspiring people in prayer, but there is no greater feeling than saving a life. Q: You work closely with human frailty. Does that make the High Holy Days more poignant for you?